As more economic sanctions are imposed on Russia by a West spearheaded by the US supposedly to change Russia’s attitude towards the geopolitical conflict over Ukraine, ever wider economic sectors in Russia come under financial pressure, and what is more, trade in crucial technologies is reduced. Apart from the direct impact of sanctions, a drastic drop in investor confidence will mean that numerous cross-border projects will be cancelled, down-scaled or postponed, and capital flight puts financial markets and the rouble exchange rate under pressure. The fact that the Russian economy is in a process of modernization, where a number of industries are only in the early phase of (re)integrating into the wider world economy, could mean that the current Ukraine conflict may have a strong structural effect in shaping Russian industry. A quick, but unlikely, normalization of the new East-West conflict would certainly reverse many of the short-term economic effects. However, investor confidence may take longer to return. And the fact that the Russian economy is in a process of modernization, where a number of industries are only in the early phase of (re)integrating into the wider world economy, could mean that the current Ukraine conflict may have a strong structural effect in shaping Russian industry (and those of its economic partners engaging, or disengaging, with Russia). The power equipment industry discussed in this article will serve to illustrate this point. Before addressing the present modernization stage of the industry in particular and the related development policies, initial paragraphs will review Soviet legacies in the electricity sector, in order to address the larger context of Russia’s transition economy. Russia’s power sector was an important and well-developed industry in the socialist economic system. It covered all electricity generation technologies, including an advanced nuclear program, and electricity trade was substantial within highly interconnected networks among Eastern bloc countries. Hungary, Bulgaria and Romania were sizable importers of electricity from the Soviet Union. In turn Ukraine relied on Russian power flows. Overall, transnational trade in electricity was far more important in the East than in the West with several Central European countries importing more than 10% of their power, and in the case of Hungary, up to one third. As per the IEA, the main surplus electricity producer, Russia’s generating capacity before 1990 had an age structure comparable to other European countries. In terms of generation fuel thermal capacity was predominant with 50% of total generation of 1082 TWh in 1990 based on natural gas. Due to the economic slump following the breakup of the Soviet Union, consumption and production fell by about 20% until reaching a trough in 1998. Throughout this period regulators decided to balance load equally across power plants to ensure that all capacity continued to operate, at the expense of efficiency – additional maintenance and increased transmission losses. New investments were scaled back drastically. The result was that Russia maintained high spare generation capacity at increased cost, and at the same time opportunities for export continuously reduced. The resulting reserve and excess capacity reached 41% of total installed capacity by 1998 and was still 25% above the 1990 mark in 2010, as visible in the figure above. Russian GDP and Electricity Production 1991-2010. Chernenko 2012. Investments in new capacity dropped drastically in the 1990’s and 2000’s. Spare capacity only reduced progressively in the latter decade, with electricity production returning to Soviet levels around 2011. For over two decades the sector has been basically living off what was left from Soviet times. This infrastructure is outdated and inefficient today and requires substantial refurbishment and extension of electricity generation facilities. 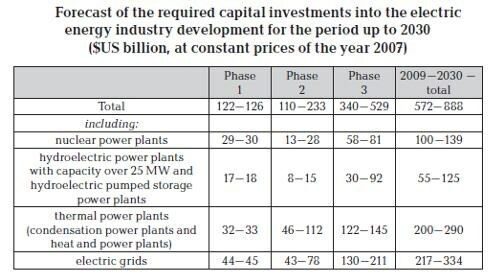 In a two-scenario projection of low and high demand growth, the Russian government estimates put needed investments in power generation and distribution over the 2009-2030 period at 572 to 888 billion USD, summarized in the table below. In the conservative scenario of lower demand growth over the period, 173.4 GW of new generation capacity are anticipated to be commissioned, while 67 GW of old, inefficient power plants will be taken off the grid. The largest investments will occur in thermal and nuclear generation, followed by hydropower. Renewable energy (consisting primarily of hydropower plants of less than 25 MW output, wind and solar) will assume only a negligible role. To put these figures into perspective, 173 GW of new capacity corresponds to approximately 75% of existing power plant capacities in Russia, which is currently the 4th largest power supply industry in the world. Forecast, expected investments in the power sector up to 2030. Russian Energy Ministry, 2010. As pointed out by the International Energy Agency, the above forecasts were made before the consequences of the 2008 financial crisis could be clearly seen. Growth outlooks for the Russian economy have since had to be revised considerably, and consequently electricity demand will not increase as anticipated. However, even under an outlook of depressed economic growth, the requirement to refurbish and modernize the aged power generation fleet in Russia means that the investment cycle will not change fundamentally. More than two thirds of thermal generation capacity is over 30 years old, 80% of nuclear capacity is reaching the end of its lifetime, and 78% of hydropower plants have to be renovated. This investment cycle will be shaped by the ownership structure of power generators in Russia, constituting the demand side for power equipment such as generators and turbines. Procurement of power generation equipment by electricity utilities, which are state-controlled or where power producers are themselves equipment manufacturers, will likely occur according to priorities that differ from those whose equipment is acquired by private generators or those without a manufacturing base. Foreign investors E.ON, ENEL and Fortum, have commanding stakes in approximately 15% of generation in Russia. As per the present ownership structure of the industry, Russia’s power generation is dominated mainly by the following groups of owners: government-dominated (Gazprom, Rosatom, RusHydro, InterRAO), industrial conglomerates of the natural resource sector (Rusal, IES, SUEK, Norilsk Nickel, other), region-controlled (Tatenergo), and foreign private (Enel, E.On, Fortum). Among those, the largest four generators, i.e. Gazprom, RusHydro, Inter RAO and Rosatom, are all state-controlled and their generation capacity represents more than half of Russia’s total, and consequently they account for the bulk of power equipment demand in the sector. Foreign investors E.ON, ENEL and Fortum, have commanding stakes in approximately 15% of generation in Russia. The overall value of sales in the Russian power equipment market has amounted to 10.4 billion USD, representing approximately 0,2% of Russia’s GDP; in the Soviet period, it accounted for roughly 3% of the economy. On the supplyside of the Russian industry for power equipment, three groups have accounted for approximately 90% of domestic manufacturing in 2011. Including foreign suppliers’ market shares, OJSC Power Machines, OJSC Atomenergomash, and OJSC OMZ respectively supplied 26%, 20% and 14% of the market in 2012. In the same year the overall value of sales in the Russian power equipment market has amounted to 10.4 billion USD, representing approximately 0,2% of Russia’s GDP. This figure reflects the relative greater importance of the industry during the Soviet period, when it accounted for roughly 3% of the economy. 20-30% of production of Russian manufacturing was for export, mainly steam and hydraulic turbines, towards traditional Soviet markets in the CIS region, Asia and South America. The highest share of imports was in the market for gas turbines, where domestic manufacturers covered about 50% of demand. According to information published in its annual reports, Power Machines has a share in Russia’s power equipment market of about 60%. Its products include turbines and generators for thermal, nuclear and hydro-power facilities with sales of approximately 44 billion RUB in 2012. As per contracts concluded in 2012, 77.5% relate to the CIS region; other important projects are in southeast Europe, India, Vietnam and South America. The ultimate owner of more than 98% of equity is Alexey Mordashov, who is also the majority owner of Russia’s coal and steel giant Severstal. Government-controlled Gazprom and Rosatom own major Russian equipment manufacturers, extending indirect government control beyond electricity generation to the equipment manufacturing section of the market. Atomenergomash, which is controlled by the government corporation Rosatom that also serves as the operator of the nuclear generation fleet, produces equipment for nuclear and thermal power generation (overall sales in 2012, including other businesses: 52 billion RUB). It acts as the sole supplier for a range of products for nuclear power generation, which constitute about 90% of its registered orders in 2012. Roughly 20% of the orders are for export, of which 60% relate to projects outside of the CIS region (among them China, India and Bulgaria). OMZ has been incorporated into the Gazprom group through Gazprombank, which owns 100% of equity, along with another smaller power equipment manufacturer, REP Holding. Besides providing heavy industrial engineering for other sectors, OMZ supplies the nuclear industry. Its 2011 sales amounted to 7.2 billion RUB. Reinforcing the potential for policy-influenced market outcomes, government-controlled Gazprom and Rosatom own major Russian equipment manufacturers, extending indirect government control beyond electricity generation to the equipment manufacturing section of the market. Russian government policy papers such as the Energy Strategy of Russia for the period up to 2030 identify the power equipment industry as a potential export sector and as a possibility to diversify the country’s natural resource-reliant economy. However, substantial technological and cost-competitiveness deficits are identified, which are to be overcome by employing new technologies and forging alliances with foreign enterprises in Russia. In the longer-term, equipment sourced from abroad shall be reduced from approximately 50% to 10-15% of the total utilized in Russia. Structure of the global power engineering market. Gushchina and Livintsova, 2013. Technological deficits are identified in all generation technologies, most pronouncedly so regarding gas and steam turbines. While production capacities at Russian manufacturers are, with the exception of gas turbines and generating units, assessed to be sufficient to cover forecast domestic demand, efficiency deficits and uncompetitive costs means that foreign-sourced equipment will only gradually lose markets in Russia. It is envisioned that foreign-acquired equipment will reduce from a market share of 40% in 2015 to a stable range of 10-15% in 2030. [In Russian strategic documents] technological deficits are identified in all generation technologies, most pronouncedly so regarding gas and steam turbines. At the same time the industry is envisioned to integrate into the world economy and become an important exporter. 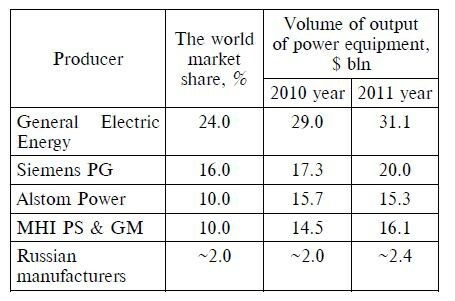 After a phase of restructuring and innovative development, Russian manufacturers are to be able to compete on world markets after 2016 and cover a market share in the global industry of 15% in the longer term (it is currently estimated to be in the range of 2%), which would make the Russian electrical industry an important supplier of world markets. Russian manufacturers are to be able to compete on world markets after 2016 and cover a market share in the global industry of 15% in the longer term (it is currently estimated to be in the range of 2%). As with regard to international competition, the strategic documents point out that the industry is dominated by four international groups: General Electric, Siemens, Alstom, and Mitsubishi Heavy Industries. The contest for traditional markets of Russian manufacturers in the CIS and Asia is described to have become fierce, including instances of price dumping and favorable customer financings. Apart from mentioning numerous institutional and reforms of the scientific-technological processes, the documents cite a need for the creation of joint ventures with leading foreign companies, both for catering towards the domestic market and for conquering foreign markets for power equipment. As a measure to promote exports, Russian policy-makers refer to the practice of granting loans at subsidized interest rates. In summation, public statements and strategies of the Russian Federation consistently identify the power equipment manufacturing sector as a potential driver to modernize Russia’s economy. They also describe the crucial role of introducing and adopting foreign technologies by means of joint ventures, licensing, and cooperative alliances. Moreover, the modernization of domestic industries is to go hand in hand with an outward internationalization through increased exports, -strategies put into question as economic cooperation with the West is affected by sanctions and the general insecurity of an escalation of the conflict. The global power engineering market is valued at approximately 200 billion USD in 2012 and is highly concentrated (see the table below). The businesses of the industry’s four major groups, General Electric, Siemens, Alstom and Mitsubishi Heavy Industries cover about 60% of global market demand. General Electric is currently preparing to acquire Alstom power units, which will increase concentration further. The manufacture of turbines and generators is science-, technology-, and capital-intensive, which creates barriers for new market entrants. It is described to be highly competitive in general and specifically with regard to the “young” combined-cycle gas turbine industry, where efficiency improvements have been occurring rapidly. The latter is especially relevant for Russia’s power sector with its over-proportionate reliance on inefficient simple-cycle gas generation units. Industry leaders General Electric, Siemens, Alstom, and Mitsubishi have all entered the Russian market and they are the most important joint venture partners of Russian manufacturers. Industry leaders General Electric, Siemens, Alstom and Mitsubishi have all entered the Russian market and they are the most important joint venture partners of Russian manufacturers. Power Machines established a joint venture with Siemens, in which Power Machines owns 35%, for the production of Siemens-licensed gas turbines in Russia. Construction of plants began in 2012, start of production is planned for 2014. Within a 50/50% joint venture established in 2011 with Toshiba, Power Machines will manufacture power transformers under license in Russia. Atomenergomash’s international cooperation is most important with France’s Alstom. In a joint venture in which Atomenergomash holds a 51% stake, construction on a production plant for steam turbines and generators for nuclear power plants was started in 2012, which will be operational in 2016. Further agreements were signed in 2014 with Mitsubishi-Hitachi Power Systems from Japan and Korean Doosan Heavy Industries & Construction on cooperation in thermal power technologies. Since 2009 General Electric has entered into license and technology transfer agreements with Gazprom-bank on the manufacture of gas turbines for both gas transportation and electricity generation in a venture with REP Holding. Besides those involving the larger established Russian manufacturers, there are a number of other major cooperations between multinationals and Russian partners. Holding a 50% share in a common venture with state corporation Rostec and state power concern InterRAO, General Electric is producing gas generation units at a newly-built factory, which will be operational in 2014. RusHydro and Alstom set up a 50/50% joint venture in 2011 for small-to-medium-capacity hydro-power equipment production. Other joint ventures were announced by Mitsubishi Heavy Industries and Renova for gas and steam turbines (according to its website, Renova investment holding in turn has controlling stakes in generators IES and Rusal, among others, again establishing a strong link to the generation-side of the power equipment market). Summarizing, cooperation primarily takes place in the form of joint ventures, where the Russian domestic entity often retains a controlling stake in an almost equitable 50/50% venture. Summarizing, cooperation primarily takes place in the form of joint ventures, where the Russian domestic entity often retains a controlling stake in an almost equitable 50/50% venture. Except for the case of Power Machines, Russian partner firms are either local manufacturers controlled by companies that are also active in power generation (Rosatom, InterRAO, Gazprom, Renova group) or generators establishing new ventures (RusHydro). All of those, with the exception of Renova group, are, as well, either state corporations or majority controlled by the Russian government. Russia might react to reduced economic cooperation with the West by pivoting more strongly towards Asia, primarily China, including in the electricity industry. Thus, in line with stated government objectives mentioned earlier, domestic power equipment manufacturers are engaging in a process of modernization by forming alliances with foreign majors. Through the observed state-control over the industry and the form of ventures, where Russian firms maintain controlling stakes, domestic control over these international partnerships and both the power generation industry and equipment manufacturing is extensive, a fact not unfamiliar to other crucial economic sectors, such as in the oil and gas industry. Inter RAO and the State Grid Corporation of China are studying the development of an 8 GW coal power plant, which is to utilize brown coal deposits in the Far Eastern Amur region, for which first agreements were signed this year. Most of the mentioned joint-venture cooperations between Western multinationals and Russia’s domestic incumbents are in early development phases, where production facilities are still to become operational. While Western sanctions have thus far targeted the Russian oil and gas industry and there are no reports about terminations of any of these alliances, it is not unreasonable to assume that enterprises will reassess risks involved and actual divestments/terminations will become more likely the longer the market is affected by insecurity. In parallel developments, the number of signals has increased that Russia might react to reduced economic cooperation with the West by pivoting more strongly towards Asia, primarily China, including in the electricity industry. For example, Inter RAO and the State Grid Corporation of China are studying the development of an 8 GW coal power plant, which is to utilize brown coal deposits in the Far Eastern Amur region, for which first agreements were signed this year. The project would be the world’s largest coal power station and its production would equal 5% of current Russian power generation. The power is planned to be exported to Peking via a 2000 km transmission line. The cost of up to 24 billion USD, will be financed by Chinese development banks; Inter RAO is set to hold a 51% stake in a joint project company. The project would address China’s growing electricity demand and concerns over air pollution in its big cities. Large scale electricity export projects are also being planned with regard to abundant Siberian and Far Eastern hydro-power resources, for which there is too little local demand or for which power transmission towards central Russia is infeasible. Siberian utility Eurosibenergo has set up an equitable JV with China Yangtze Power, a large hydro-power company in that country, in order to jointly develop 10 GW in generation capacity, mostly from hydro-power stations in Eastern Siberia. Though the generated electricity will primarily be for export, some will be used to power heavy industry of Rusal in Russia. After the conclusion of feasibility studies, the projects will seek financing from Chinese lenders. …the power industry in Russia will take quite a different development path if the current Ukraine crisis extends for a longer period. Similarly, at the end of 2013, RusHydro has announced it will start cooperating with the mother-company of Eurosibenergo’s partner, China Three Gorges Corporation, on construction of hydro-power plants along the Far Eastern Amur river, and has entered into a partnership with Power Construction Corporation of China to develop and finance small hydro-plants in Russia and abroad. While many of these projects have been discussed for lengthy periods, an uptick of reports on initiatives was observable as the Ukraine crisis unfolded. And, although Chinese-Russian cooperation in the electricity sector has so far been mainly reported for power projects, increased overall exchange will likely also affect the Russian power equipment manufacturing sector. One may expect, for instance, that equipment supply towards Chinese-Russian mega projects will occur under different terms, primarily cost-wise, than in Russia’s home market or in other foreign markets. Cooperation under these initiatives will thus likely affect Russia’s industrial policies as well. In combination, the mentioned fact that many joint venture projects between Western manufacturers and Russian peers are in early “fragile” stages and the observed occurrence of increased energy cooperation between China and Russia, may mean that the power industry in Russia will take quite a different development path, if the current Ukraine crisis extends for a longer period. Obviously, in such a scenario, economic gains can only be postulated for China, since all other involved parties, including Western and Russian industries, will be deviating from their paths of first preference. Daniel Tappeiner is a graduate of the ENERPO program and has a background in finance and energy. ← US Natural Gas Export: A Sensible Move?